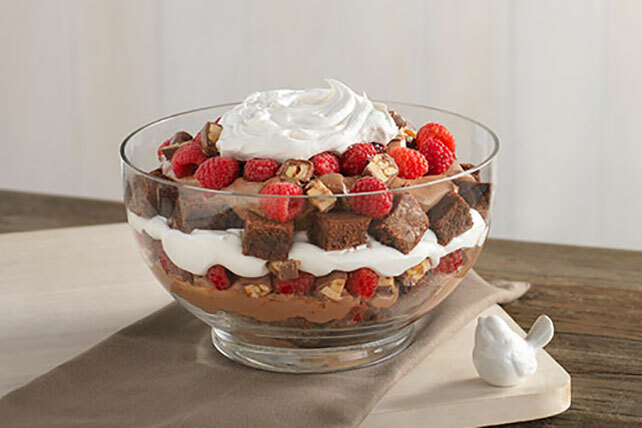 Serve up our delicious Chocolate-Raspberry Trifle recipe. This Chocolate-Raspberry Trifle is the perfect combination of dessert flavors and textures. Microwave semi-sweet chocolate and butter in large microwaveable bowl on HIGH 2 min. or until butter is melted. Stir until chocolate is completely melted. Add sugar; mix well. Blend in eggs and vanilla. Stir in flour. Spread onto bottom of 8-inch square pan sprayed with cooking spray. Bake 25 min. or until toothpick inserted in center comes out with fudgy crumbs. (Do not overbake.) Cool completely. Meanwhile, beat pudding mixes and milk in large bowl with whisk 2 min. Stir in 1 cup COOL WHIP. Refrigerate 1 hour. Cut brownie into 1-inch pieces. Place half the brownies pieces in 2-qt. serving bowl; top with layers of half each of the pudding mixture, raspberries, chopped candy bars and remaining COOL WHIP. Repeat layers. Since this trifle makes 18 servings, it is the perfect dessert to serve at your next party. For added convenience, the brownies can be baked ahead of time. Cool, then store, tightly covered, at room temperature up to 2 days before cutting into pieces and using as directed.